Turkey has been seeking to buy an unknown number of Harrier fighters as a stop-gap measure until the F-35B short take-off/vertical landing (STOVL) version of the Lightning II Joint Strike Fighter (JSF) is ready for Turkish service, Jane’s has learned from reliable Turkish and Western defense industry sources. Jane’s earlier reported that Turkey had expressed to the United States its interest in purchasing 19-20 of the F-35B STOVL version. This is in addition to the 100 F-35As it already plans to buy from Lockheed Martin. Turkey first approached the United Kingdom about the purchase of Harriers but then turned to the United States for the AV-8B in the inventory of the US Marine Corps because the aircraft have not been used by the UK armed forces since 2010. Honestly, this hardly makes sense at all??? First, I doubt the USMC would give up any of it's remaining AV-8B's in the short term. Second, it hardly just the Harriers themselves. It's everything associated with them from Spare Parts, Maintenance, Pilot and Ground Crew Training, Infrastructure, etc. etc. etc. Then by time you got that all in place. You would start all over again with the F-35B. Which, at least share much of the aforementioned with the Turkish Air Force F-35A's! In short forget and just wait on the F-35B's! Corsair1963 wrote: ...Honestly, this hardly makes sense at all??? First, I doubt the USMC would give up any of it's remaining AV-8B's in the short term. Second, it hardly just the Harriers themselves. It's everything associated with them from Spare Parts, Maintenance, Pilot and Ground Crew Training, Infrastructure, etc. etc. etc. Then by time you got that all in place. You would start all over again with the F-35B. Which, at least share much of the aforementioned with the Turkish Air Force F-35A's! ....maybe, but ....if Turkey "Wants" to get into the jump-jet business, this is a cheap time to gather up a/c from England, Spain, India, Italy, US and determine what infrastructure is required and maybe get a head start on that ski-jump ship they are designing; if and when the F-35B "ever" delivers. I'm beginning to see where Turkey is struggling to stay in NATO and benefit from the technologies shared by the NATO members and also placate their Muslim partners demands around the world. Erdogan is one "heck" of a juggler! Honestly, acquiring second hand Harriers would be expensive and time consuming. Hardly, worth it when Turkey is already getting F-35A's for the Turkish Air Force. .... Serious is the theme. Turkey will have the boat and Harriers, at least. The Sunnis will eventually meet the Shias and hopefully before they unstabilize more Mid-East governments. The Duo of Russia and Iran will expand their influence, unless NATO stops their game, with Turkey. Russia and Iran are playing each other as the Dunce and creating as much desolation as possible as exemplified by Lebanon, Iraq, Syria, Yemen. Libya, etc. Turkey with the F-35A/B has a long way to go to win back these stable governments (hopefully democratic republics) with the assistance of allies. NATO can support this effort or it can sit on the sidelines and have no influence. Its a difficult and different calculus with the Trump decision to declare Jerusalem. Politics always play a part in military buys. Turkey can be expected to think twice or use a buy rejection (even if they were never going to) as a way to show some reaction. I think the Saudis and the rest who have spent billions on US military buys would find that their regimes become the targets for Iranian propaganda. Particularly easy to inflame when it comes to religion. Again the big winner is Israel since any de-stabilisation of Arab states play directly into its hands. Syria = down. Egypt = down. Iraq = down. Jordan and Lebanon = too weak to matter. Israel hasn’t been too comfortable with the big Saudi buys. Next up is the Iranian nuclear deal which would be cancelled and sanctions reimposed. 40 years of diplomacy down the drain but this is trump world now. I would be very surprised if the Harrier deal actually goes thru. Turkey has 2 LHD/Light Carrier programs and is also in the process of purchasing HMS Ocean (See https://www.dailysabah.com/defense/2017 ... er-carrier ). The TCG Anadolu class LHD/Light Carrier being built by Sedef Shipyards can operate upto 24 S/VTOL aircraft. TCG Anadolu should be commissioned in late 2019. Turkey does not believe it will have time to acquire the F-35B's in time. In any case it would be quite expensive to purchase 24 x 3 batches of F-35B's for the 3 LHD programs. Thus, it is most likely that Turkey will acquire used Harrier's from Spain, Italy and the US to use on HMS Ocean and TCG Anadolu. On top of all this Turkey is seeking to project power abroad in a bid to protect its bases in Qatar and Somalia. airforces_freak wrote: Turkey has 2 LHD/Light Carrier programs and is also in the process of purchasing HMS Ocean (See https://www.dailysabah.com/defense/2017 ... er-carrier ). ....The USMC could have as many as 32 AV-8Bs (2 ex-squadrons) available for sale, not counting the Brit Harriers/ parts. neptune wrote: ....The USMC could have as many as 32 AV-8Bs (2 ex-squadrons) available for sale, not counting the Brit Harriers/ parts. (a) The USMC is struggling to get 66 AV-8B ready basic airframes even with the current inventories and only managed to get close due to the GR-7 acquisition (68000 parts used from the airframes since acquisition = UK harriers aren't flyable). (b) The USMC needs to maintain 93 AV-8B PAA for the FRS & 5 VMFA sqn + additional 13 TAV-8B for the FRS sqn against a current inventory of 112 AV-8B+16 TAV-8B. The earliest I can see availability is in FY21-22 when 2 sqns will convert. If USMC is going to buy more Bs to bring forward conversion, the Turks might as well buy more Bs now to meet their needs. Buying F-35Bs now will mean delivery from FY 20 onwards. I don't see the Marines giving up any airframe that has not been picked cleaned of parts, isnt beat to hell, or doesn't have the latest upgrades to include safety upgrades. Turkey is going to modernize/upgrade them in any instance so it would take any airframe it can. I even suspect that Turkey may want to inspect them in order to explore a S/VTOL version of the TF-X or even HurJET in future. Who knows. What we know is that Turkey will field 2 LHD/Light Carriers and possibly 1 LHD (ex HMS Ocean) and needs S/VTOL aircraft. To date it has only evinced an intention to purchase 22 F-35B's. 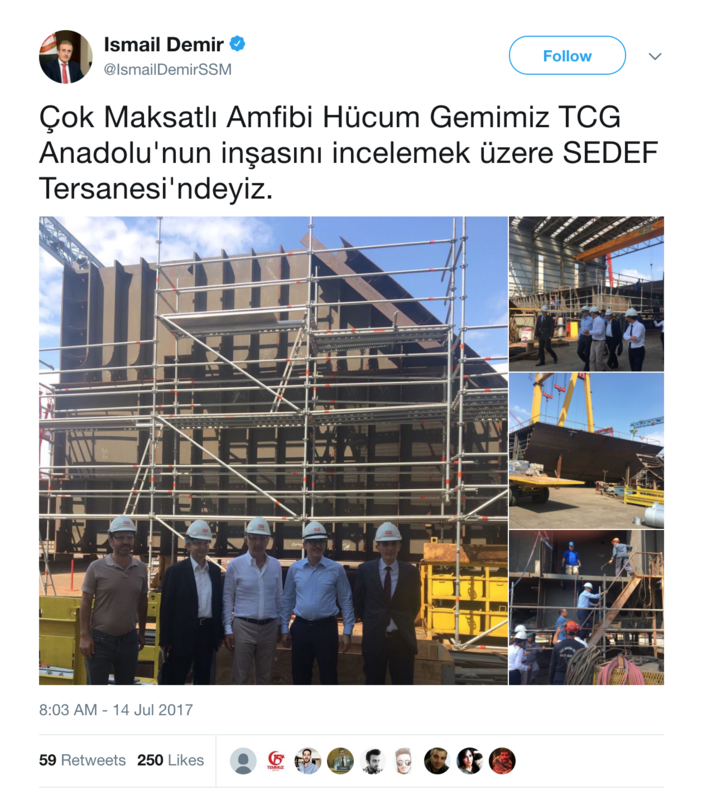 Turkish Defence officials confirmed on Twitter in July that TCG Anadolu was already on the slipway. It should thus be complete by late 2019.
airforces_freak wrote: Turkey is going to modernize/upgrade them in any instance so it would take any airframe it can. the airframes will be toast not to mention the lack of spares and the engines havnt been made in decades. But I know you will ignore this and waive the ottoman magical money wand and the problems will disappear! Once upon a time the same was said about the F-4E's. 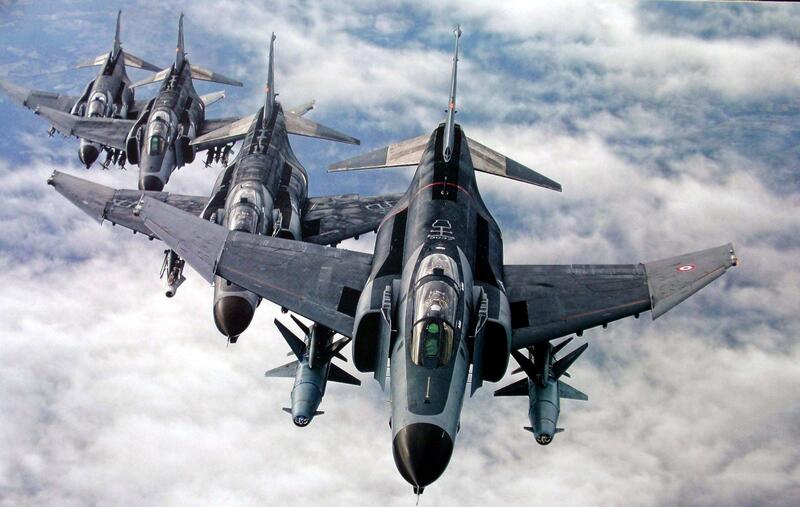 Turkey started buying F-4s since the 70s. That's totally different from integrating a vstol aircraft that has already ended production.